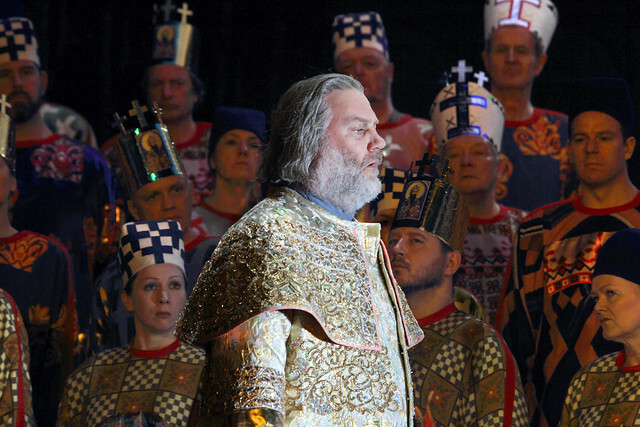 Our quick introduction to Musorgsky’s masterful epic opera on the perils of power. Following the death of the Tsarevich Dmitry, Boris Godunov is persuaded to become Tsar of Russia. However, Boris seems plagued by mysterious guilt. A greedy aristocrat and a restless young monk each plot to turn Boris’s fears to their advantage. Musorgsky based Boris Godunov on the play of the same name by Alexander Pushkin, published in 1831 but the censorial ban on which was only lifted in 1866. Pushkin’s play was loosely inspired by the true story of Boris Godunov, Tsar of Russia from 1598 to 1605. Several of Pushkin’s other characters – such as Grigory Otrepiev and Vasily Shuisky – were also based on historical figures. Musorgsky wrote his own libretto, compressing Pushkin’s 25 scenes into seven scenes or — in the revised version — four acts and a prologue, and using Nikolay Karamzin’s History of the Russian State to help him portray Russian life of the period. Musorgsky completed his first version of Boris Godunov in 1869. It was rejected by the Imperial Theatre in St Petersburg for having too many choruses, insufficient arias and ‘big tunes’ and no love interest. Musorgsky expanded the opera (including a whole new act) and his second version had a successful premiere in 1874. Due to tragic personal circumstances, it was to be the only opera the composer would complete. Revised editions of Boris Godunov were made after Musorgsky’s death by Rimsky-Korsakov and later by Shostakovich. Most productions now combine elements from both of Musorgsky’s versions of the opera. This production is the first given by The Royal Opera of Musorgsky’s original version. Boris Godunov's score is rich in musical invention, including ingenious use of a motif representing Boris’s guilt, folklike songs for the rogue monk Varlaam and the Holy Fool, and imaginative use of arioso (half aria, half accompanied recitative) for Boris’s soliloquies. There are also fine choruses, particularly in the opening scene. The 1869 version is rare in 19th-century opera in having few formal arias and no principal female roles. Throughout Boris Godunov, grand crowd scenes contrast with intimate depictions of the Tsar and his inner circle. Particular highlights include the Coronation Scene (Scene 2), Boris’s touching scene with his son and daughter in Scene 5, the dramatic encounter outside St Basil’s Cathedral in Scene 6 and — greatest of all — Boris’s farewell to his son in the final scene.